On the blog today I am so excited to share with you the beautiful historic home owned by my cousin Jackie and her husband Jeff. This beautiful Victorian home was built in the late 1800's and is located in Toledo's Historic Old West End. If you are a fan of architecture and old homes, touring the Old West End is a MUST! From the 1870's to the 1920's, Toledo's leading architects built ornate Victorian, Edwardian and Arts and Crafts homes that is now known as the Old West End. These architects (Fallis, Bacon, Stine, Mills, and Wachter) built homes for some of the biggest names of the time, including Reynolds, Libbey, Spitzer and Bartley. The residents play a huge part in what makes this neighborhood so great. They take great pride in their community and work hard to maintain the integrity of each home and the history of the neighborhood. Each year they throw an epic festival that offers home tours and street vendors throughout the 25 block neighborhood. What neighborhood do you know that has their own coloring book?! Created by another Toledo pride small business, Jupmode. 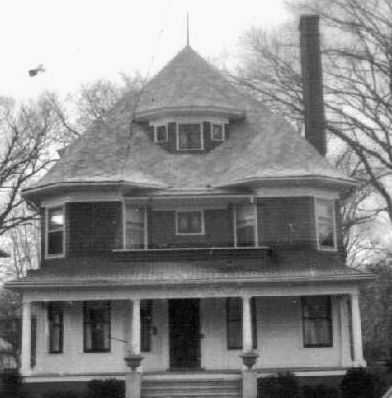 Jackie and Jeff's Victorian style home was built in the late 1800's and was the home to many of the most influential businessmen in Toledo during that time. One of the early homeowners included the President of the American Metal Wheel and Auto Company, Mr. Schoenfeld. American Metal Wheel and Auto Company built the first miniature car for children. The first car they created was the 1906 Baby Reo made specially for Barnum and Bailey Circus for the "Little People publicity" portion of the show. Isn't that fascinating?! Given my current obsession with The Greatest Showman, I found this tidbit particularly exciting. 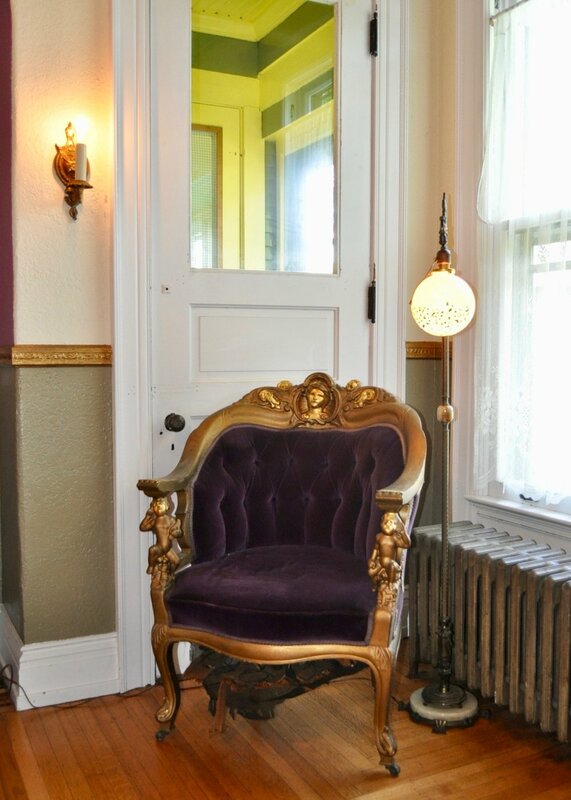 The front entrance of Jackie's and Jeff's home opens into a warm and welcoming front parlor. Their eclectic style gives this traditionally formal room a relaxed vibe. 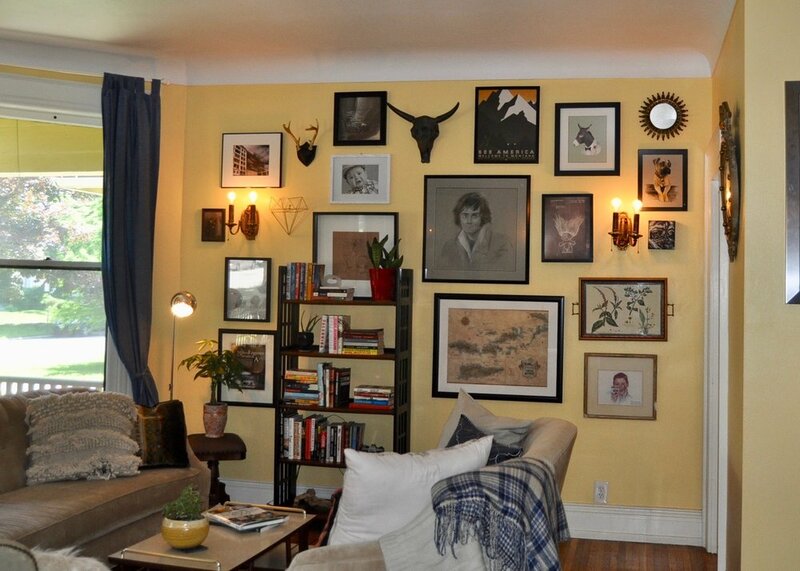 Jackie and Jeff are both very creative and artistic so this gallery wall perfectly depicts their style. Each room is filled with unexpected artwork accents, bright colors and plant displays that bring life into the space. These old homes are filled with formal trimmings that can often leave the a room feeling cold and museum-like but their cool, eclectic style makes every room feel inviting and modern. How cool is that planter bar over the windows?! (For more tips on decorating with bold colors, check out this post). The ornate detailing on the ceiling is in great condition and the vintage chandelier is so fun! Not many people can so effortlessly incorporate a flying pig into their home design, but Jackie and Jeff easily pull it off! 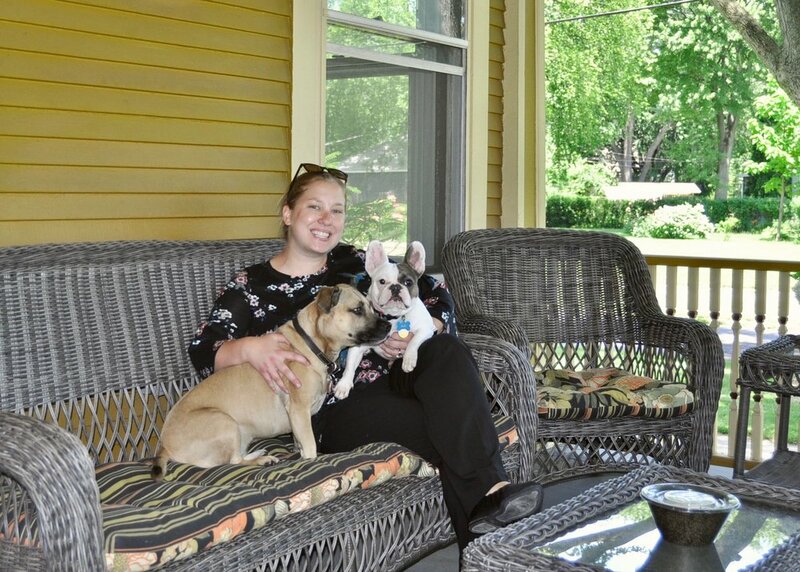 Before Jackie and Jeff moved in, they attended an estate sale at the house and purchased a bunch of beautiful vintage furniture, including the full dining set. I love all of the original old sconces throughout the home and this 1920's art deco floor lamp is perfect in this cozy corner (not to mention super heavy!). What is not to love about this home office?! The dark wood and the vintage wallpaper work together perfectly. Throughout Jackie and Jeff's house, you will find signs of the past that add to all of its character and charm. In the study there is an old pencil sharpener installed on the wall. The kitchen was recently updated with all of the modern amenities you need. The new appliances have a 1950's vibe that add to the charm of this home. The house consists of five bedrooms and 2.5 baths. My favorite part of this guest room is definitely the original diamond windows. I love the bright colors in the room and the large canvas artwork on the wall. In the corner of the room there sits an old marble sink base that again gives hints of the homes past. This bright and airy master bedroom is the perfect retreat after a long day. Jackie and Jeff have plans to add more artwork on the walls, but for only living in this house for one month, I am super impressed with all of the artwork already hung on the walls! This original fireplace is in perfect condition and beautiful! The creative artwork above the mantel tones down the formality of the grand fireplace in the bedroom. Also, check out the ornate molding! The original bathroom is my favorite room in the house! The shower and tubs do not work so it functions as a half bath and also as a showpiece of the history of the home. I have never seen anything like the shower in this bathroom. It is called a needle shower (or a ribcage shower) that was popular during the turn of the century. Because I geek out to this type of stuff, I found an old advertisement of a similar shower from the 1890's. The bathroom has a beautiful clawfoot tub and a smaller tub, called a foot basin, that was used for washing your feet before entering the bath. If these were still in working condition, I would totally use that foot basin to wash the dogs! The original sink is still intact and a few of the original built-in shelves remain. You can see where some of the original attachments have been removed. The previous owners refinished the second full bathroom and it looks beautiful. Subway tiles, basket weave marble floors, a pedestal sink and schoolhouse pendants give this bathroom the 1920's feel with modern materials. Jackie and Jeff have big plans for this bonus space. This will be turned into the ultimate entertainment loft. 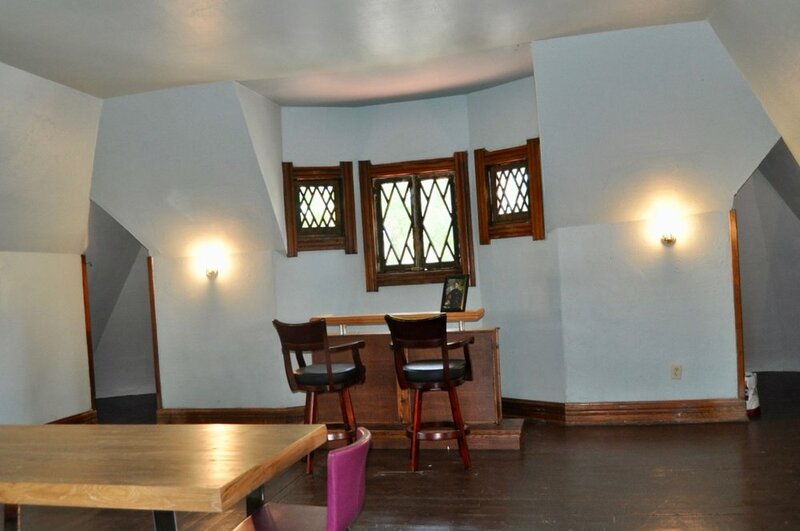 Along with the great bar built by Jeff, they will be adding a large projector screen to the other side of the room to host parties and watch big games. Jackie is also planning on creating a meditation nook in one of the spires to the left and right of the image. I can't wait for the first party! Another piece of the past on display; an old gas light sconce in the loft. The front porch is Jackie's favorite spot in the house. This spacious front porch is the perfect place to host guests and mingle with all of their friendly neighbors. It's also a great spot for snuggling pups! The property has a spacious backyard with a detached garage. This backyard will soon house a chicken coop, compost bin and vegetable garden. Another cute flying pig accent in the garden. Little Ari approves of her new home. Thank you Jackie and Jeff for letting us tour your awesome home!